I think one of the top “satisfying to the taste buds” sandwich is definitely a BLT. This hot dog recipe is a BLT with a California twist! What could be better than any food you eat – that has bacon in the name? In my mind, bacon is totally a vegetable and a basic must have food group. When I started playing around with hotdog recipes I kept thinking how popular my Ultimate Blue Cheese BLT Sandwich was when it hit the blog and thought let’s make that into a hot dog. I left out the “L” for lettuce, because it seemed too healthy next to the bacon and added avocado so you got an awesome cream texture that changed it from boring ketchup or mustard. Along with simple ingredients, there are some easy tips to make sure the ingredients pop and stand on their own. Grab your ingredients and follow along with the video. With your hot dog in the bun – let’s start building! Add tomato slices, mayonnaise, avocado and bacon – enjoy! *Bacon Tip (I learned this from watching Ina Garten on TV. ): Heat oven to 400 degrees and cook bacon for 10-15 minutes. 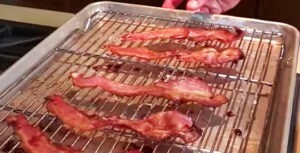 I use a grate and baking pan to make my bacon super tasty with less mess. Lol! Thank you so much. I wish we had technology that I could hand you one through the computer. Happy Eating!